I have this thing about being appropriate. I like furniture where it’s expected, I dress as requested for occasions and I’m meticulous about thank you notes. So it stands to reason I love seasonal decor and never would have pumpkins out in April. With fall approaching, and in line with my quest for appropriateness, I like to begin to introduce fall decor into my home in subtle ways. I never jump right to oranges and golds, instead opting for soft tones that meld comfortably with my decor. We have a lovely secretary desk in my bedroom that I use as a vanity. 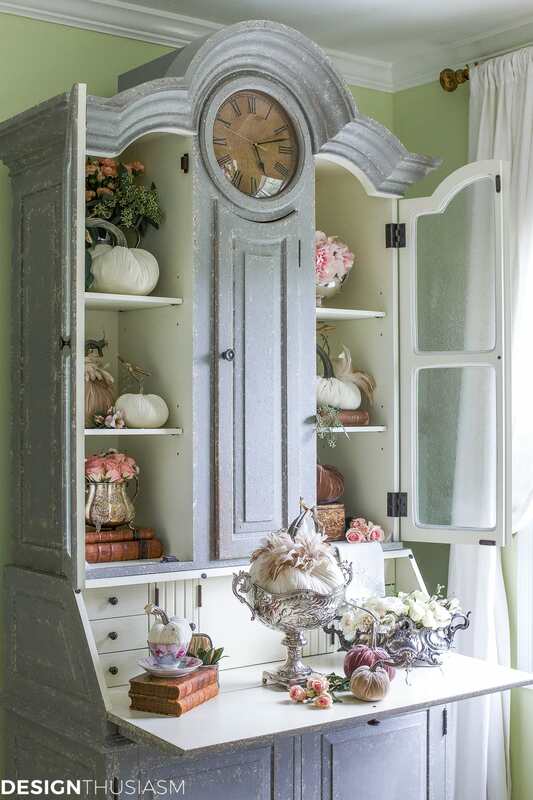 The compartments are great for storing cosmetics, but the accompanying hutch is ideal for seasonal styling. 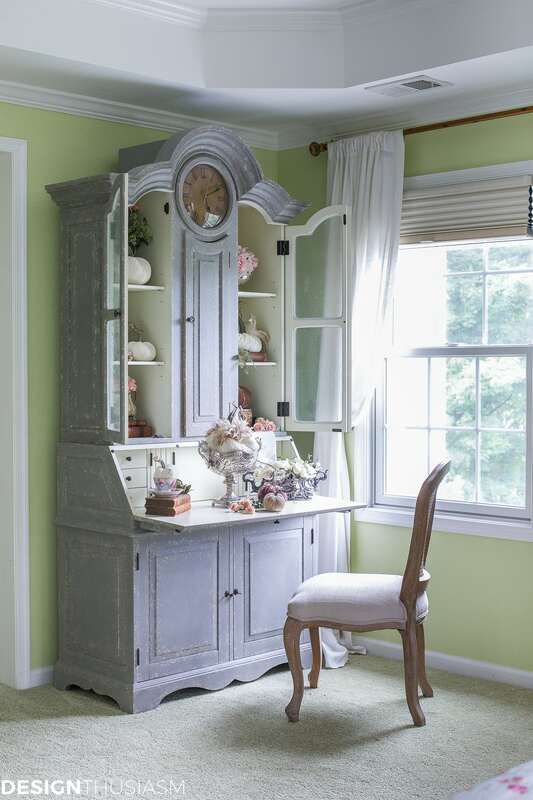 With glass doors and pretty shelving, it’s one of my go-to spots for new vignettes. Which made it the perfect spot to showcase this unique look for fall. 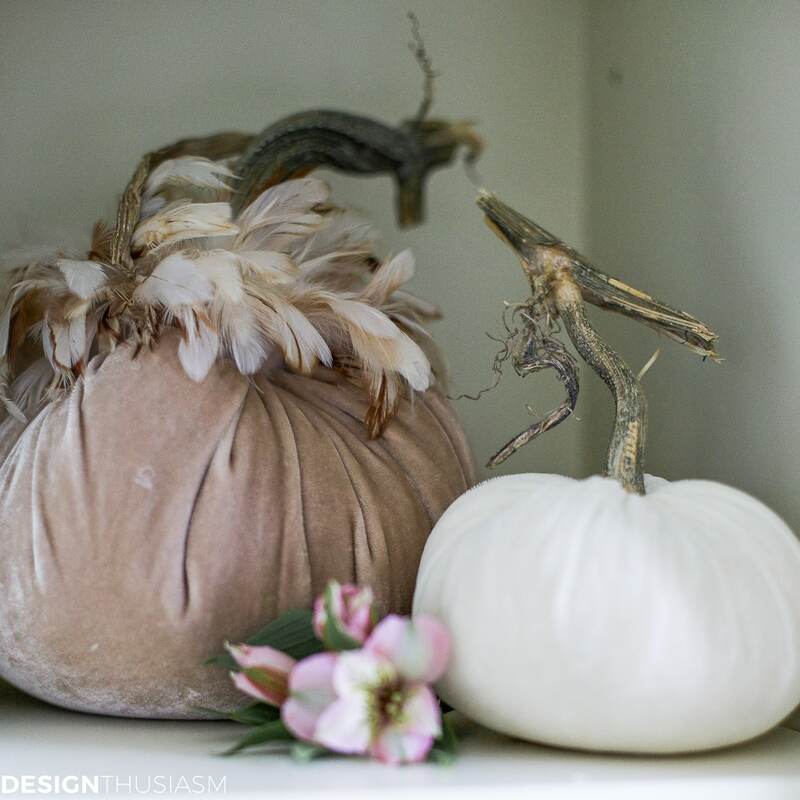 I’m absolutely crazy for these velvet pumpkins with lush feather collars! In soft white, they work perfectly with my bedroom and are a charming way to incorporate fall into my decor. While fall is one of my favorite seasons to decorate for, I’m not a fan of traditional autumn colors, and this soft palette is a more natural fit for my modern French style. 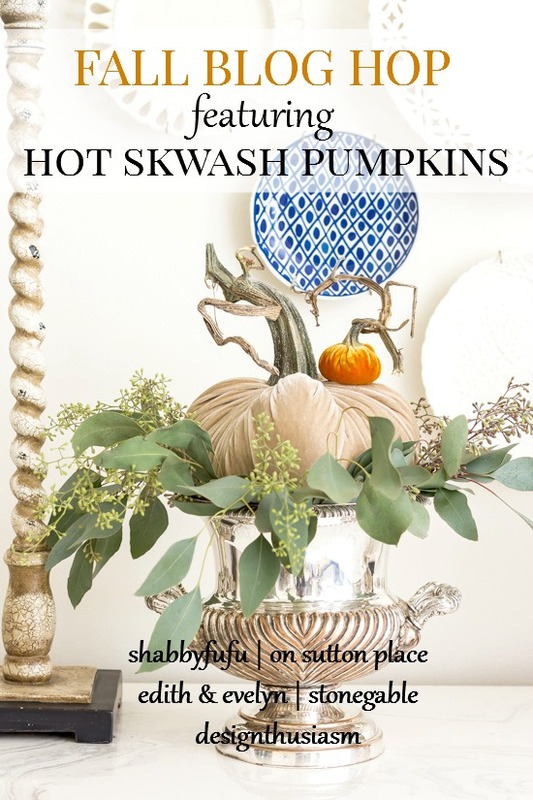 In addition to the feathers, Hot Skwash pumpkins come in solids, as well as embellished with Swarovski crystals. The gorgeous range of colors of the silk velvet and the handmade workmanship with natural stems are the hallmarks of these artful objects. 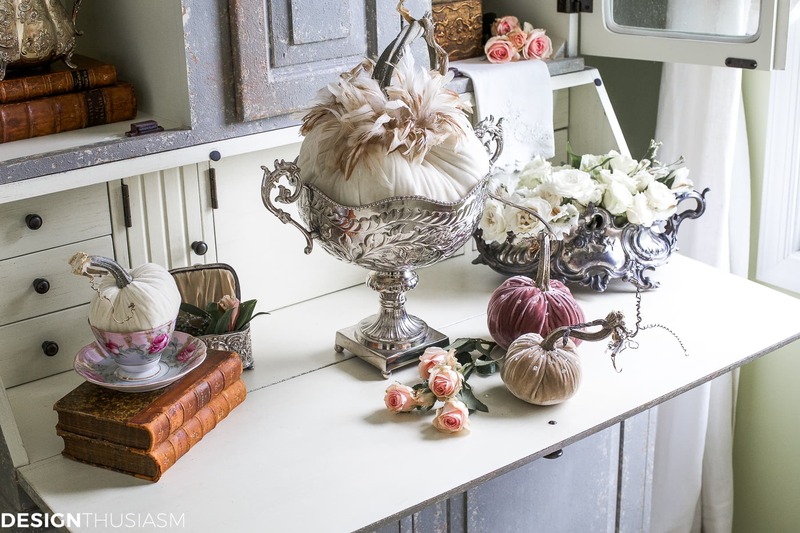 In styling my hutch I decided to mix the pumpkins with vintage silver, antique books and, as always, fresh flowers. 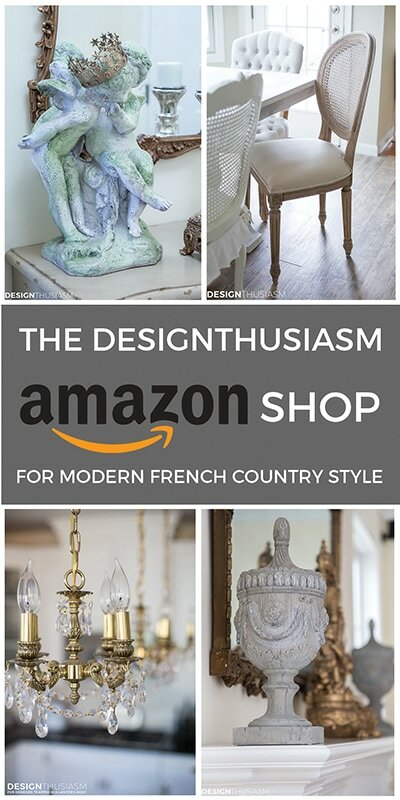 They really work with any decor style, depending on the colors you choose and objects you surround them with, but I love how they mix so beautifully with the French Country pieces in my home. 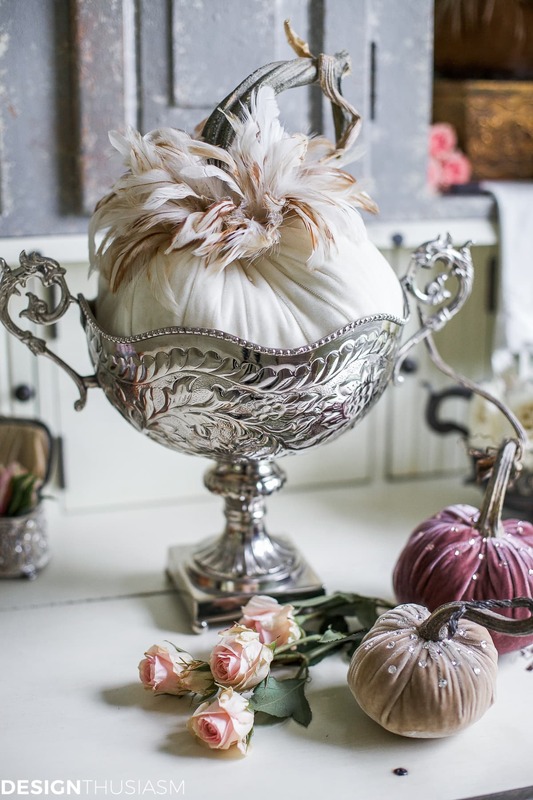 Whether tucked in a delicate floral china cup or a dramatic silver footed bowl, there are unlimited ways to decorate with these delightful little homages to fall. 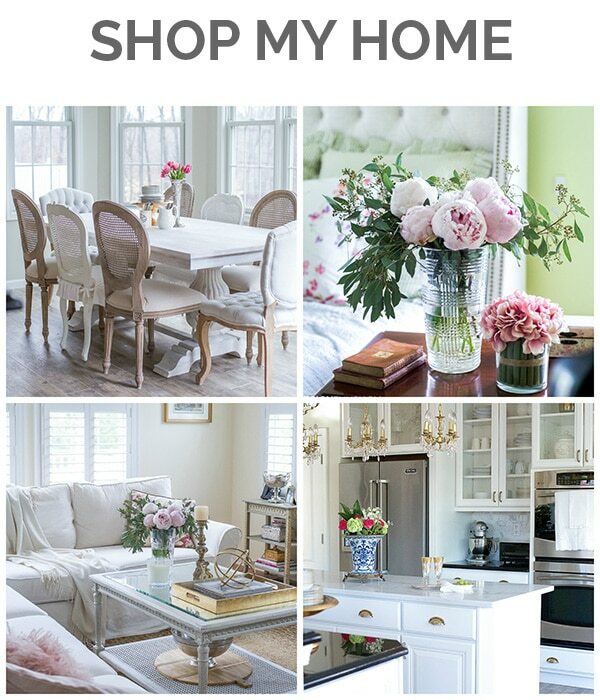 For me, styling shelves is about layering and an instinctual balance of size, placement and color. I try to vary the heights, number of pieces and nature of objects so there’s a melodic flow to the finished product. 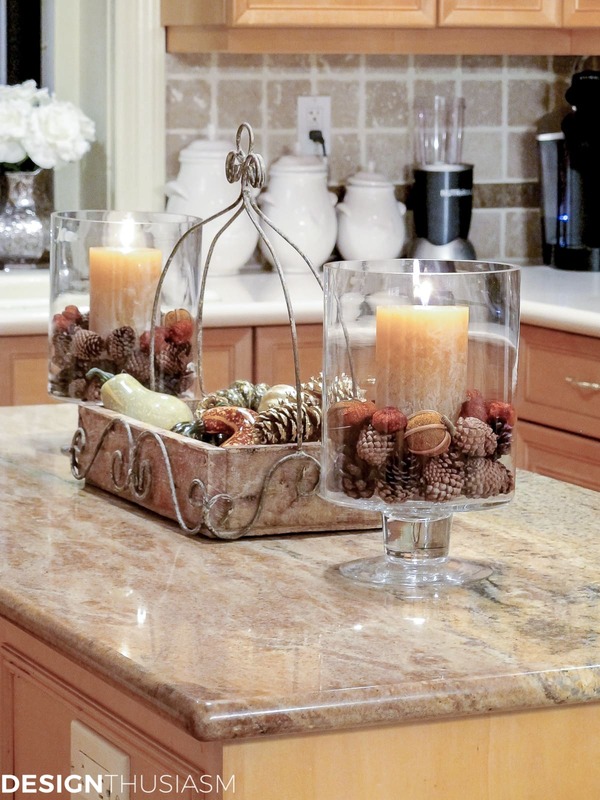 I hope you’re inspired by this lovely way to introduce fall into your home. I tend to build up to more color as the season progresses, but for now I’m thrilled with my neutral pumpkin styling which feels like a most appropriate way to welcome the season! Next up on the tour is my friend, the very talented Janet from Shabbyfufu, who also organized this tour. Be sure to visit all the posts linked below after you see Janet’s stunning post. 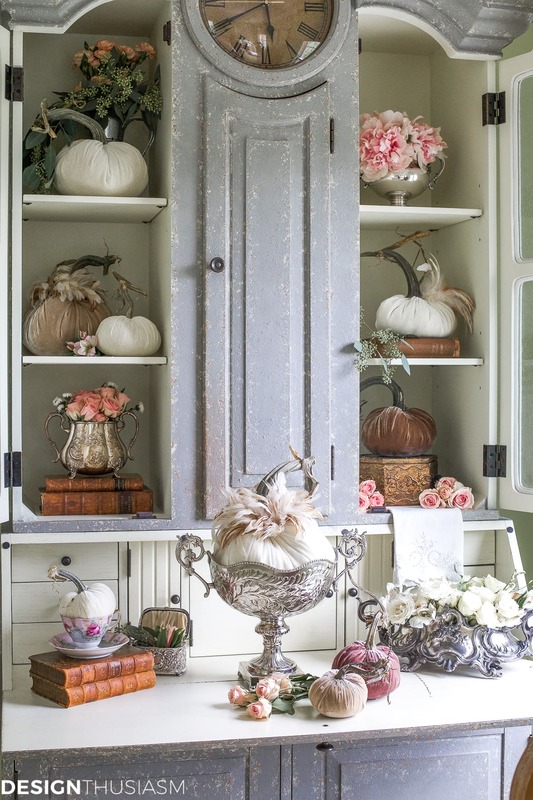 Lory, your pumpkins are gorgeous and I love the way you styled them in that Swedish cabinet….the one I’m drooling over, by the way! It’s stunning! I am head over heels for your exquisite silver pieces!!! I’m forever a fan of Baroque silver! Just gorgeous!!!!!!! You have created a really exceptional transition into fall! Thank you, Alycia! 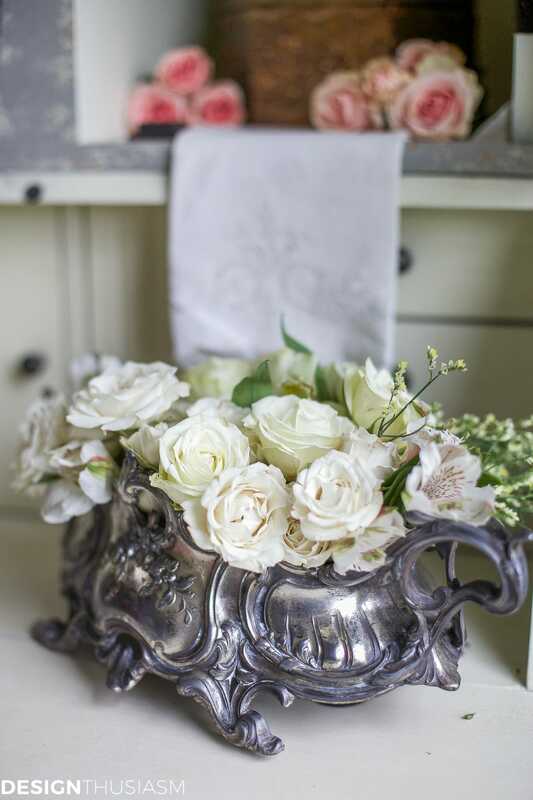 It is so much fun styling with vintage silver… 🙂 It just gives any vignette a special look. 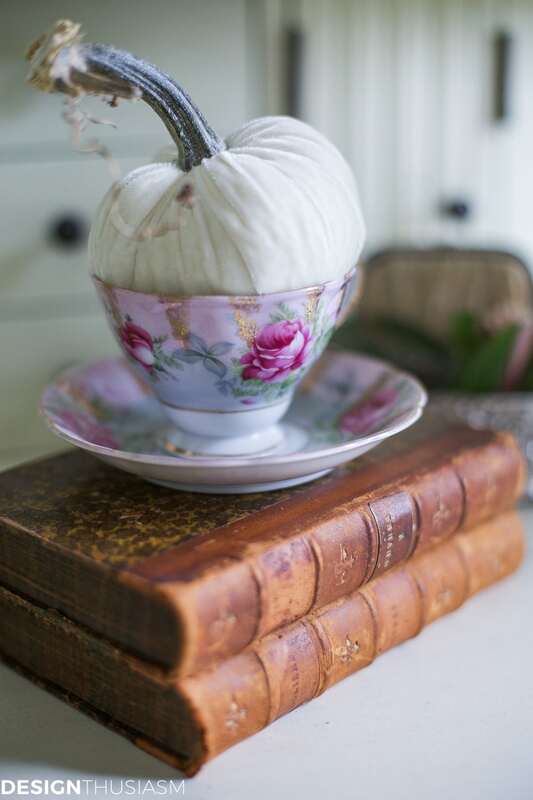 So excited for fall decorating! 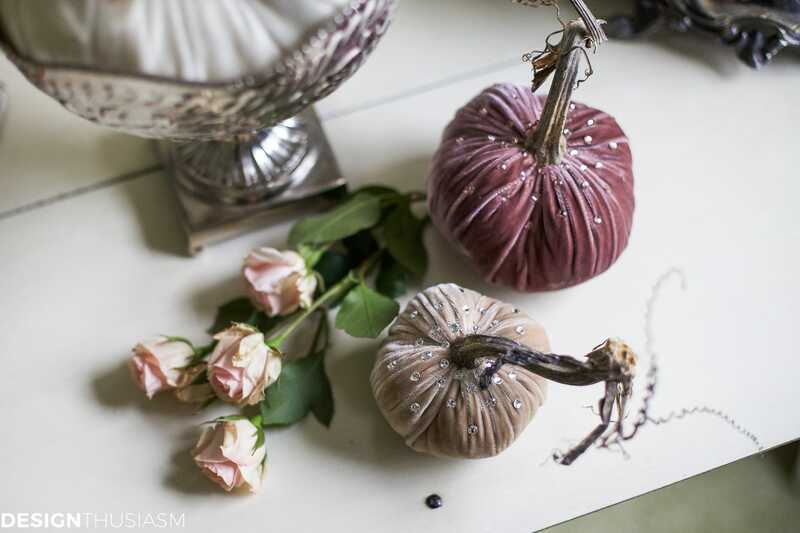 Who would ever think to put velvet pumpkins in a home office setting? Oh yes….YOU would and I love it! 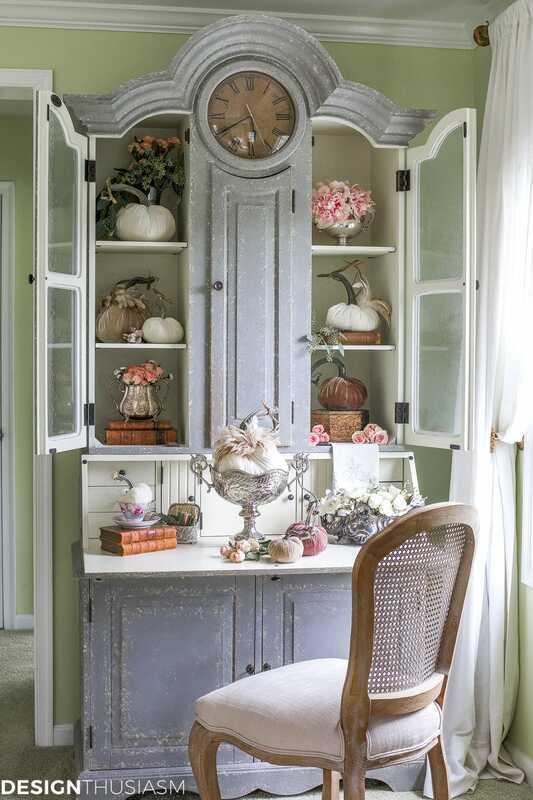 Loving the white pumpkins with the French furniture! Pretty ! I have seen other french style bloggers use these soft colors in fall. Most of my decor has moved into creams, ivories , some black and french blue and am loving it. Even so, I bring out the rusts, golds, and more black for a fall look. Including pumpkins of all colors, mostly white and blue, but also a few orange. Well, ok, orange is not a favorite. I find it all cheering, because to be honest I only endure summer here in Boulder where the sun is blistering at 5000 ft. and I do not like hot weather. Fall is a reminder that it is almost over and cool weather is on its way. And Halloween is fun. I just visited…that is nice, The green softens the bright colors and the golden goblets and grey vase are pretty also. Thanks for the link! I love your colors. I’m not a huge fan of orange so this is perfect. Thanks for sharing your gorgeous secretary. Velvet pumpkins. What a great idea! Thanks for the inspiration! Pretty. Love the little feathers on the pumpkin. What a sweet idea. Thanks so much! Happy fall to you, too… 🙂 Austria must be lovely in the fall. You absolutely had me with the whole presentation. 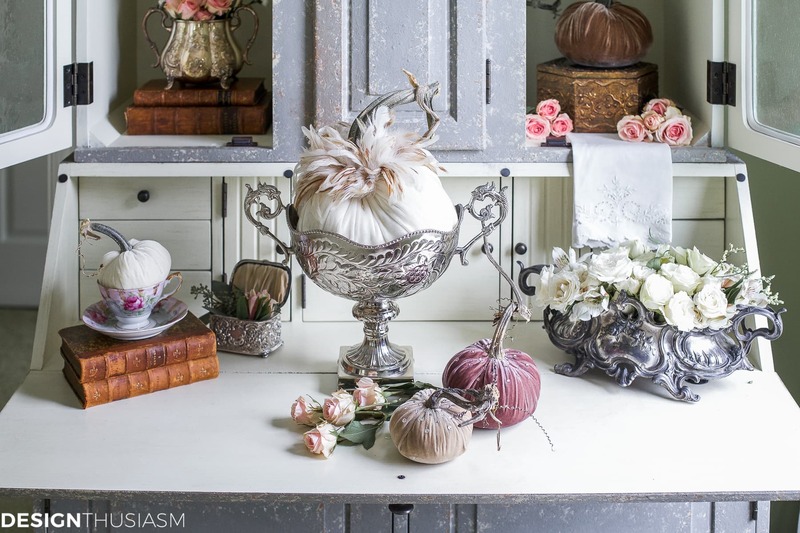 But the silver and pumpkins had me at Hello! 🙂 Thanks, Jan!! So glad you enjoyed the post! 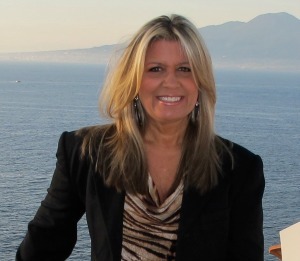 Hi Lory!….this is a first look at your blog for me! Oh my goodness!! How pretty is your secretary/ hutch!! I can’t wait to see what else you have to share! 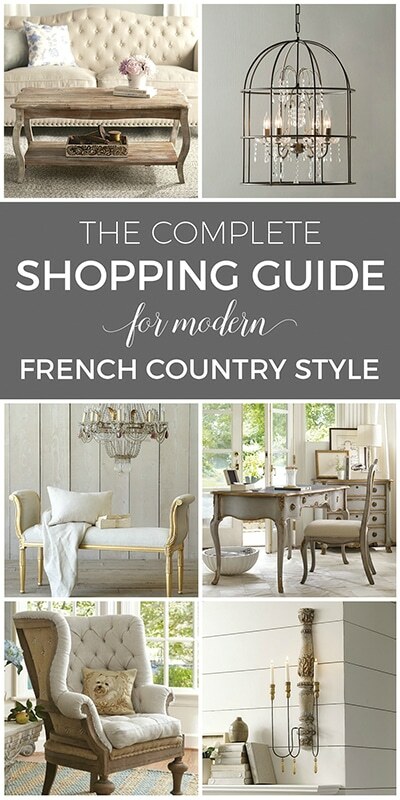 I like a French nod to my decorating and look forward to following your blog! Thank you so much Rebecca and welcome!! You’ll find lots of French decorating here… 🙂 So glad to see you here! Have scrolled the post twice and cannot find where to enter the giveaway. Help! I’m a techi nerd? These are among the most beautiful Hot Skwash pumpkins I’ve seen. Simply stunning! I love your neutral styling. I’m with you, too…I like to dress appropriately and write thank-you notes when they are owed! Hi I just found your blog. 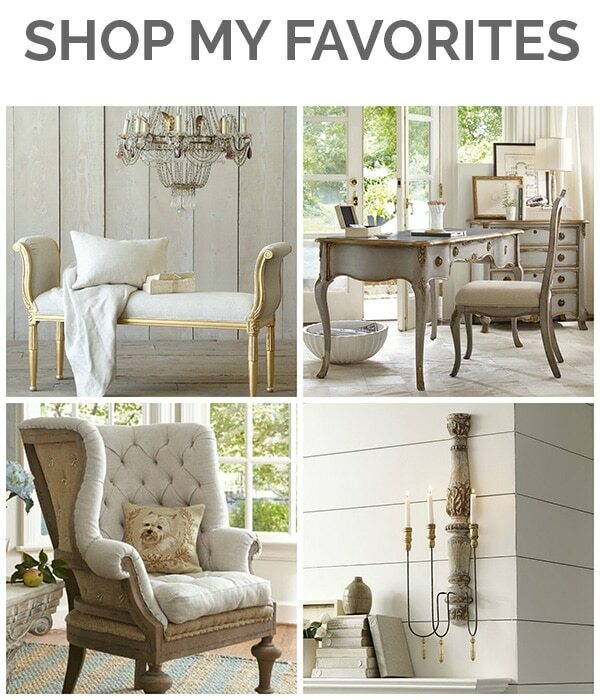 ?I’m in heaven, my eyes are drunk in love with your entire website! 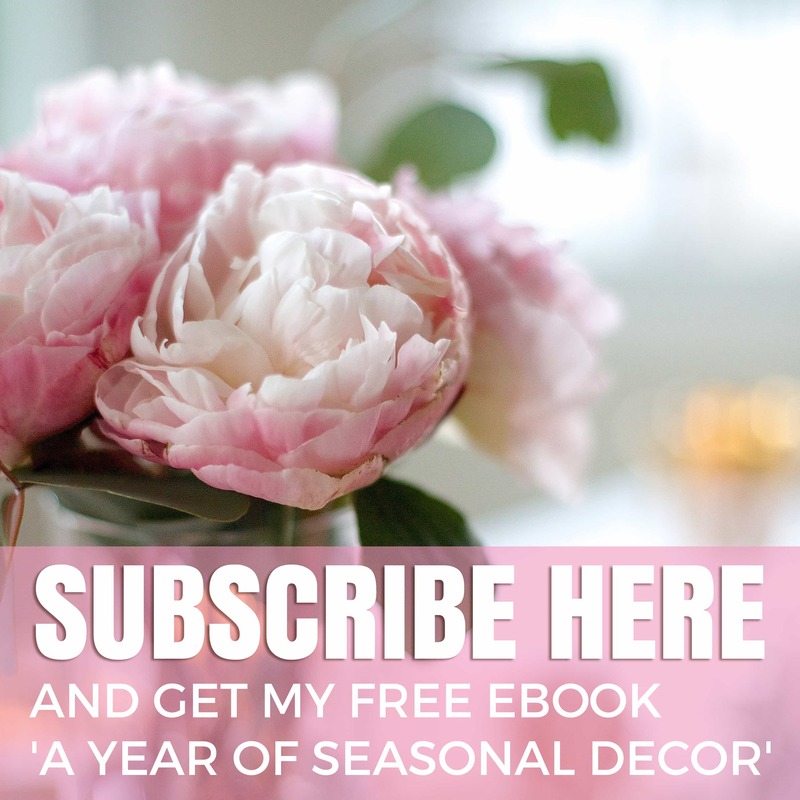 This blog has me glued to each page with all the gorgeous eye candy! Wow! I will totally binge read every inch of this blog. 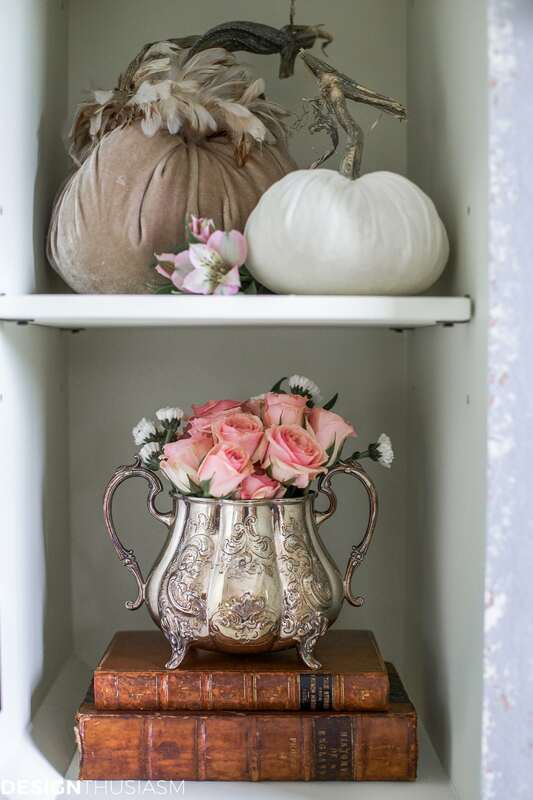 I am loving the fall colors and pretty vases with flowers. Thanks for sharing. ??? I adore that silver footed bowl. I can’t seem to find anything like it. Do you happen to know the manufacturer or any of the markings on the bottom? Thank you! It’s actually from The Enchanted Home.